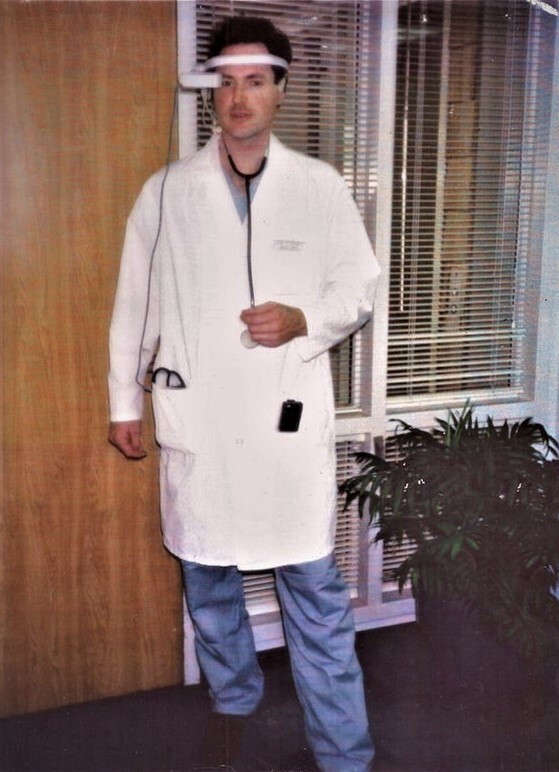 In the early 90's, Eric Horvitz and Mike Shwe created an early prototype of a handsfree trauma care system. The work was done within Knowledge Industries, a Bayesian systems startup founded in 1988 by Jack Breese, David Heckerman, and Eric Horvitz. The system employed a personal display, driven by a vibrating mirror, and a portable PC running a speech recognition system, Bayesian inference, and sequential diagnosis, employing value-of-information computations. A command and control speech system was used to make selections and input findings in a patient. The system was designed for exploration of the feasibility of providing paramedics with expert diagnostic decision support in time-critical settings. Brad Cushing (U Maryland Shock Trauma) and, later, Adam Seiver (Stanford Trauma) helped to assess the Bayesian trauma care model. Later refinements in 1992-3 were supported by an SBIR grant to Knowledge Industries from DARPA. 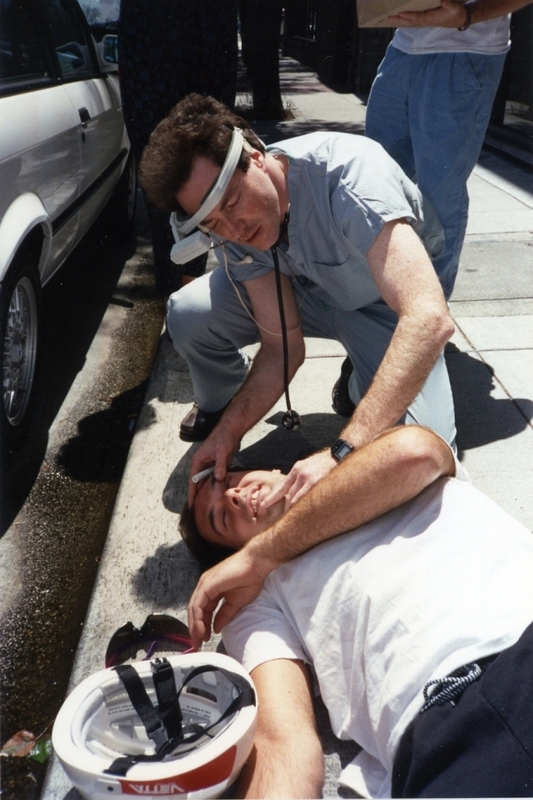 In this image, Eric Horvitz, playing the role of paramedic, and Jim White, starring as an injured cyclist, demonstrate the use of the handsfree trauma decision support system. Eric Horvitz with handsfree trauma decision support system. Pocket-sized PC loaned from DARPA ran speech recognition and Bayesian inference about patient status using Bayesian network assessed from experts Brad Cushing (Baltimore Shock Trauma) and Adam Seiver (Stanford University Trauma). System would take in observations, then update differential diagnosis and prompt for next best evaluation actions. Download short video, showing use of the system. Review longer video, including additional background and details on sequential diagnosis with an abdominal pain knowledge base. Described in: E. Horvitz and M. Shwe, Handsfree Decision Support: Toward a Non-invasive Human-Computer Interface, Nineteenth Annual Symposium on Computer Applications in Medical Care. Toward Cost-Effective Clinical Computing, November 1995.